The idea that I will never lay eyes on this man feels absolutely absurd to me. To see my Oma, without him by her side is a sight I can't imagine ever getting used to. Or that I will never hear his somewhat booming voice say 'H-i', and reach for me in a tight hug. 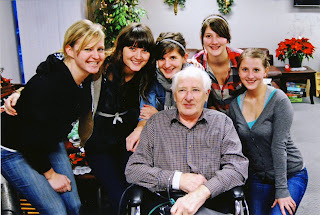 The image of him leaning out of his wheelchair, oxygen tank be damned, craning his neck towards the window and lifting his exhausted arms to wave until we were out of sight with my Oma filling the space beside him, will never leave my memory. I remember the heavy silence which filled our vehicle, all seven of us grand children speechless with the knowledge that we would never see him again. He was such a classy man. 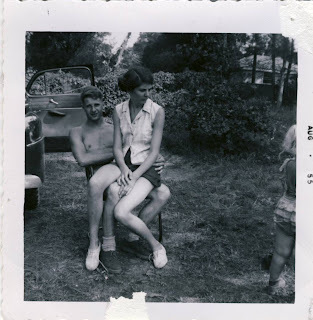 His relationship with my Oma was one filled with tender love, respect and consideration - it was a joy to see. It fills me with hope. As does the image of him no longer struggling for breath and being able to walk. He was ready.